​"I am a school principal and I want to use this for my school stuff and my own children." ​"It is useful for all ages. I teach high school and so many of my students would either relate or be able to develop empathy. You have a jewel on your hands." 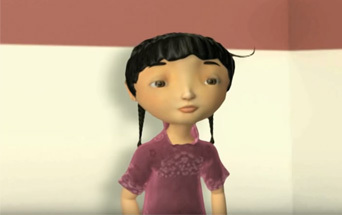 "This lovely computer-animated short tells the quietly harrowing story of Mei, a five year old girl from China now living in America and attending a typical kindergarten class in the Midwest. Struggling with a language barrier, fearful that her teacher will punish her, and finding herself to be a target for teasing, she would rather be in her garden examining butterflies and other insects, or talking to her doll. Assumptions soon are rise that Mei has a learning disability, but her mother (who also speaks no English) knows better. Suspense builds as it begins to appear that Mei will become lost in the education system -- held back in the classroom and criticized at home. Written, directed, and produced by Joyce Lee, Paper Words tugs at the heart while illuminating a scenario that Lee says (in an accompanying interview) is all too common for young Chinese immigrants. Highly recommended." Audience: Elementary (grades 1-3), high school, college & universities, public libraries. ​EMRO reviews media materials for Universities and Colleges. ​"This film cuts across race, ethnicity, generations, cultures, languages, gender and more. I am moved by the deep emotions conveyed by the characters in the film as well as all the social, political, economic, and historical issues raised by Mei's experience in school. I've witnessed children drag their parents to see the film at a recent conference where bilingual education was being discussed. It is a must see!" ​"The film will serve as an eye opener to new teachers as well as experienced teachers who are teaching in a school setting with diverse populations. It is also a useful tool for parents. This is an outstanding film. I want to buy the film and do PD at my school." ​"Wow. 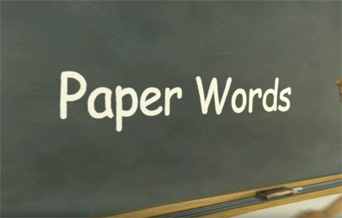 I just got done watching Paper Words. It was so moving, so touching, it brought me to tears. I love Global Voices so very much, i can't express it. Their documentaries have had such a profound impact on who i am and what believe about the world.....Thank you PBS for having Global Voices as a part of your programming."